This is one of Kirina’s favorite holidays! Laughing with friends around huge, blazing bonfires…good food and drinks…and yes, a bit of mischief included as well. 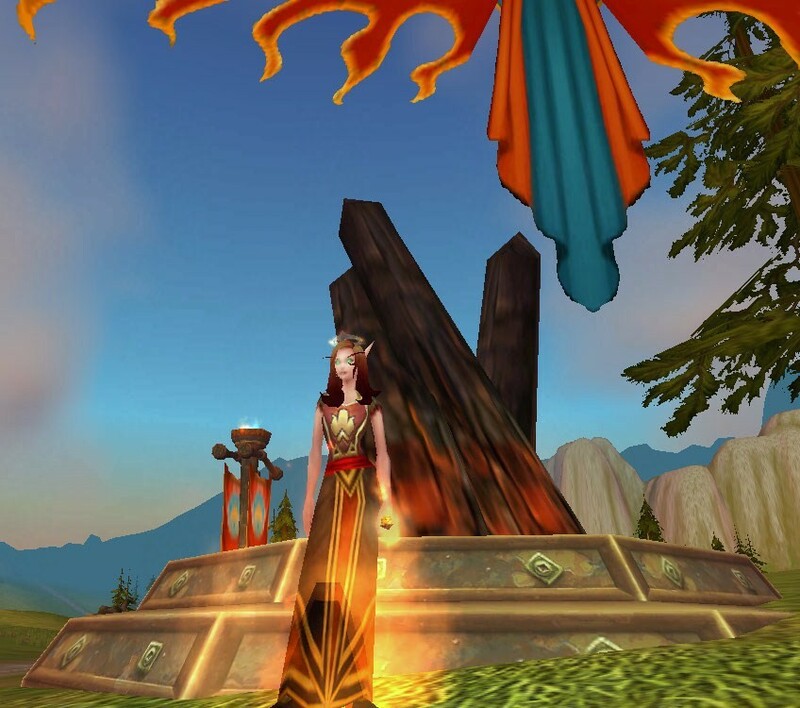 as more formal holiday attire, and is great for dancing around a bonfire in a home city – it shows your dedication to the spirit of the Fire Festival. Except for the crown and the torch off-hand, the rest of the pieces of armor are bought with Burning Blossoms from a Midsummer vendor. The crown is attainable through quests – looting the fire in each of your opposing factions cities will allow you to turn them all in to get the quest that awards you the crown for being the best thief during Midsummer. 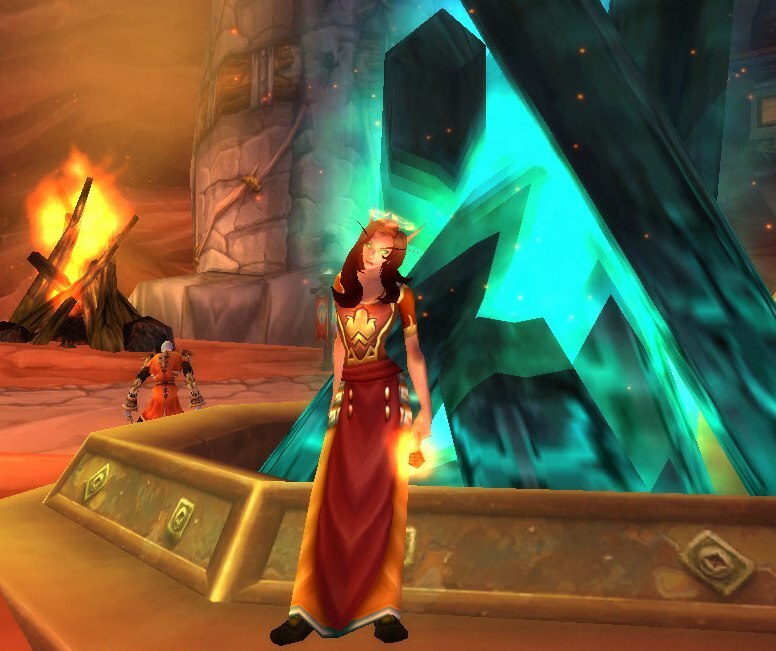 Grayson’s Torch is a reward from a lesser-known quest out in Westfall that is attainable by both Horde and Alliance players. For more casual Midsummer outfits, I chose armor that consisted of constant shades of red, orange, and gold to match this hot summer theme. 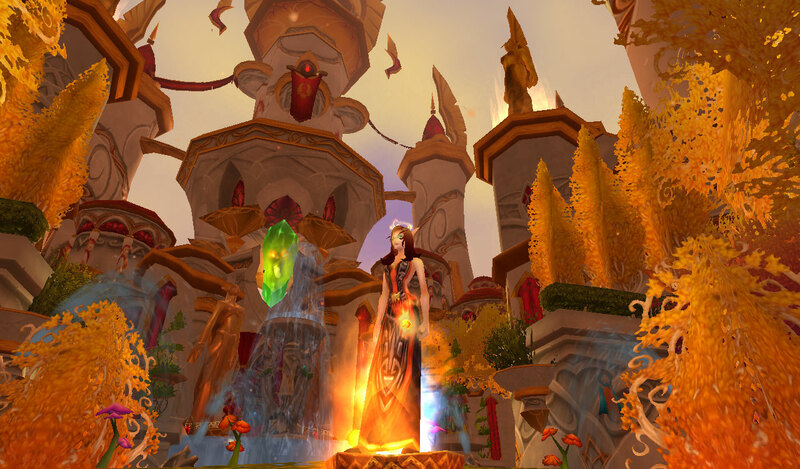 I used my Civinad Robes (a quest reward, but an almost identical match to the Simple Robe) to sorta kinda resemble a Midsummer Flame Keeper. I didn’t find (look for…?) any bracers, and, when viewed up close, the robes didn’t even match! /Fail. Oh well, it’s still a great outfit…and another use for the other-wise ridiculous (imo) shoulder mantle. 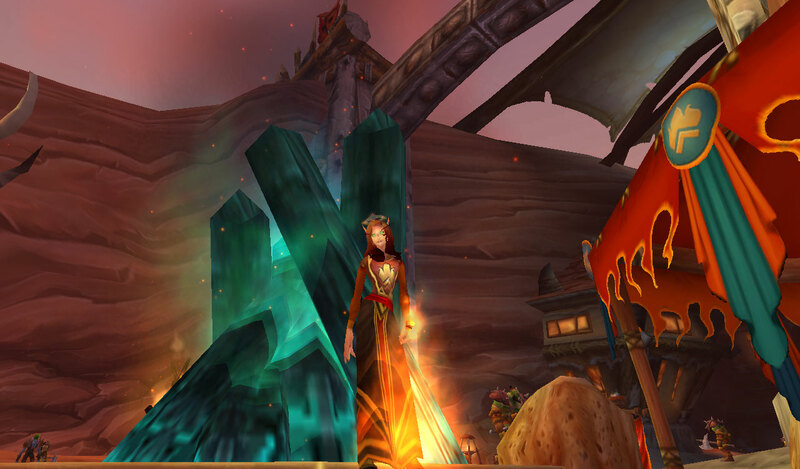 The tabard’s color blends perfectly with the color of the robes. The Amber Filigreed Shirt adds a splash of color, while still being short-sleeved enough to be cool in the summer time. 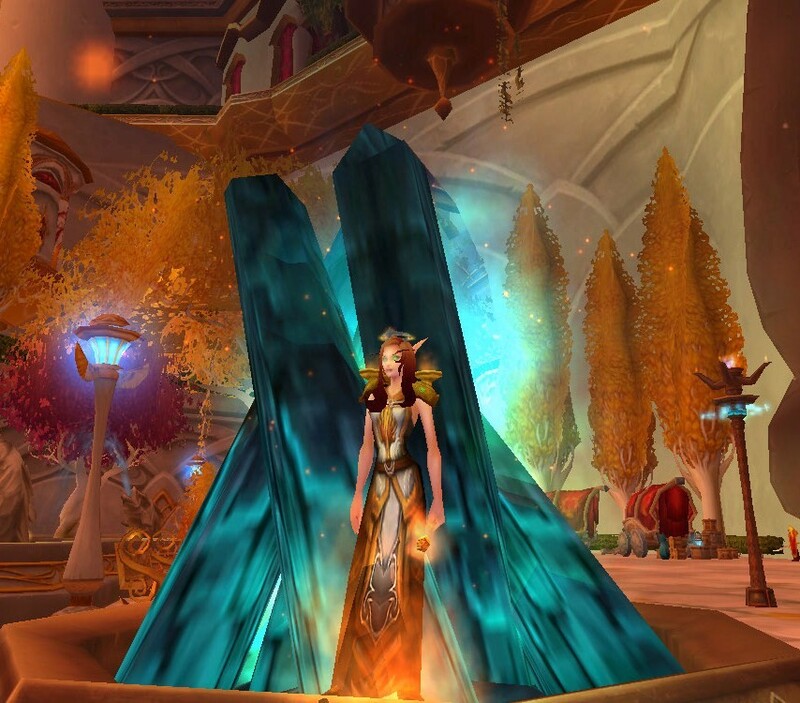 This same look can be gotten with the Tabard of Summer Skies by pairing this tabard with the Robe of Crystal Waters (Alliance only quest reward) and the Cerulean Filigreed Shirt. One other outfit uses the Sanguine Robe. The open sides of the robe and the relatively high V-neck neckline will look great on any race. These robes are not easily farmed, as they are dropped mostly by rare elites (even then…the most is .1% chance). I’ve had this robe for a long time, and I believe I got lucky with the world drop; however, I’ve seen it being sold on our server’s auction house pretty frequently. Keep an eye out for it. Also, if you research uncommon quality cloth chest-pieces, you’ll find this style of robe pop up again and again…just in case you don’t want to wait for it. Another sizzling outfit uses Bloodwoven Wraps. This is another robe that will…be kind…to every race. The short-sleeves almost remind me of a sort of T-shirt dress, but the back of the robe is cut-out for added flare. The robe also has an extremely low drop rate, but, one can get lucky browsing the local auction house ^_^ . This robe, as with the Sanguine Robe, can be found in other color-styles (sometimes, even the same robe, as in, the Geomancer’s Wraps…but that’s a low drop rate too). I added the Tabard of Summer Flames, received through the Midsummer quest line to summon and kill Ahune, the Frost Lord, to give the outfit a more Midsummer feel to it. The top and the bottom of the robe is divided by Captain Sanders’ Sash – a final reward from a quest chain that starts by looting a map after killing a ton of murlocs along the coast of Westfall (its actually not that bad of a farm, especially for higher levels). This sash, however, bears a close resemblance to the Apothecary’s Waistband (Horde vendor only, sorry). There are a couple of variations of this outfit that I also found quite nice. 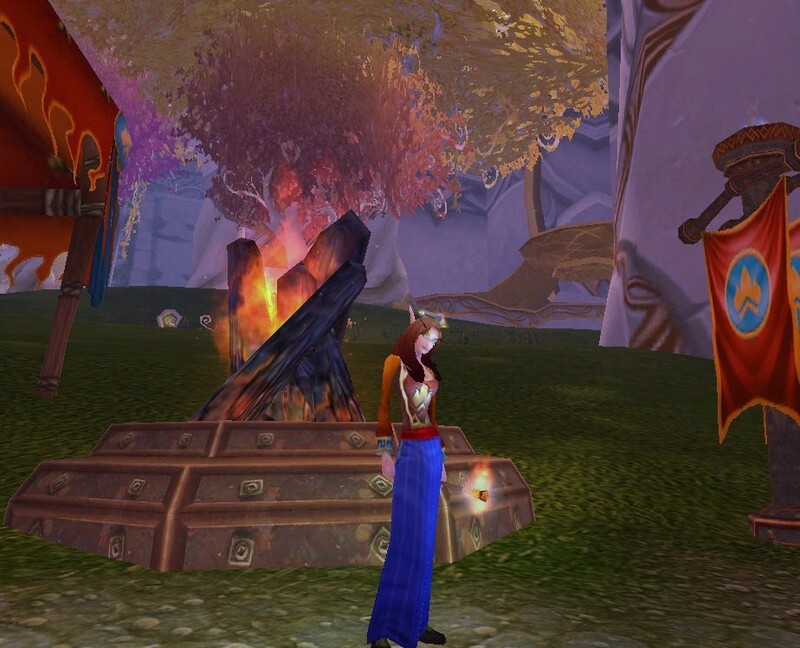 Wearing the outfit without the Orange Mageweave Shirt makes sense…it’s summer, LoL! I also took off the tabard and replaced the Orange Mageweave Shirt with the Red Swashbuckler Shirt for a more blended look. 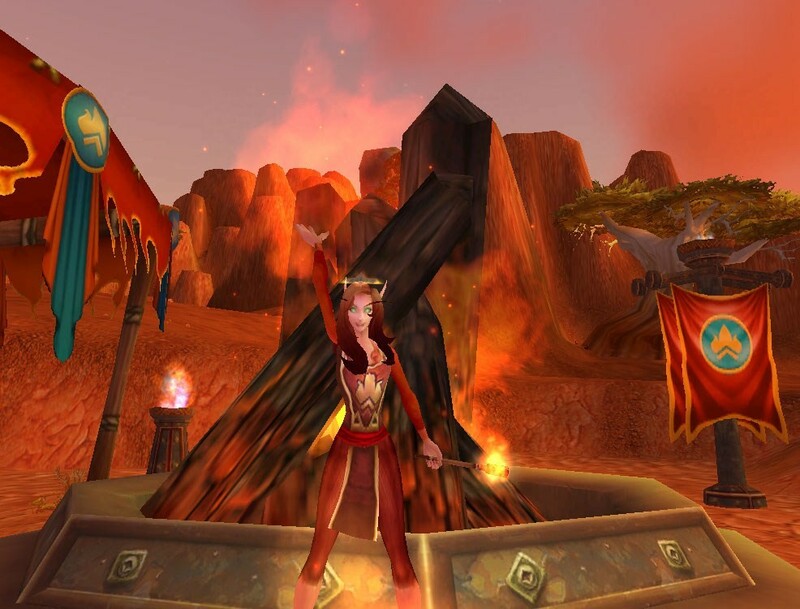 These next few outfits are the perfect ones to go run around Azeroth in while honoring/descecrating the bonfires. They are also a right fit for any race to wear. Kirina wearing casual pant armor?! Yep! I put together a feisty red outfit, the main focal point being the tight, red pants. This same type of outfit can be easily made to match the colors in the Tabard of Summer Skies, should anyone had chosen that reward – like with the Azure Silk Pants and the Blue Linen Shirt. 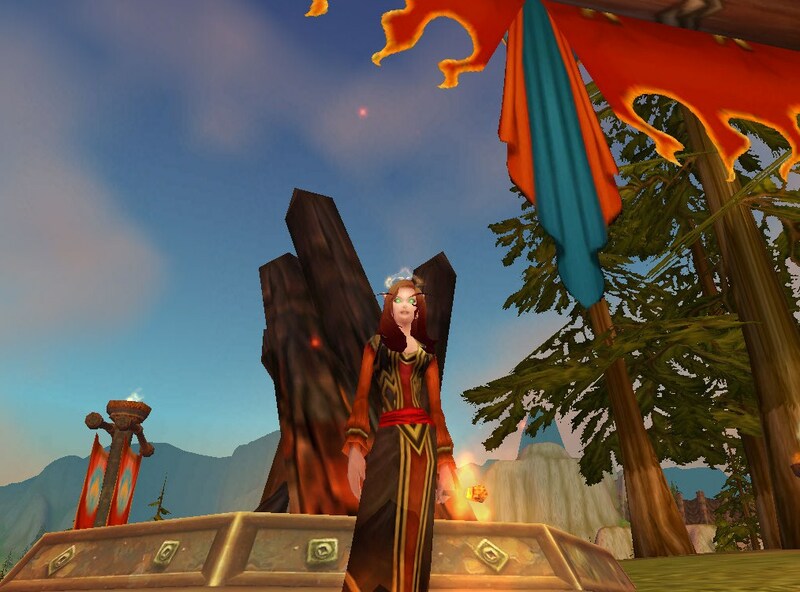 Equipping the Buccaneer’s Robe along with the Tabard of Summer Flames gives a more mild fire flavor to this festival wear. The white sleeves and a lighter red skirt bottom is a calmer, pyromaniac-in-training look; the torch gives off a subtle glow of fire radiance. The Buccaneer’s Robe is a rare find…whether by drop or through the local auction house; however, it’s a keeper once found. 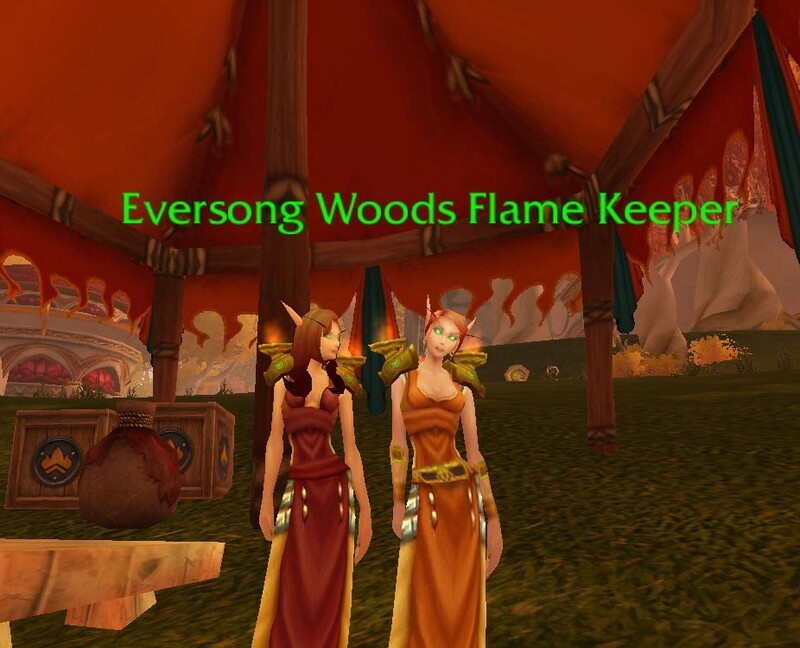 If you have the Tabard of Summer Skies, equipping the Journeyman’s Robe, or the Simple Dress, will have the same effect, only in a different color scheme. Last, but not least, a Simple Kilt outfit. Along with its no-fail versatility, I added an expensive Amber Filigreed Doublet – the blue embroidery along the cuffs echoes the blue in the kilt, while the amber shirt matches the Tabard of Summer Flames. A simple fashion design that’s sure to still get you inspected! This outfit can be made to fit the Tabard of Summer Skies by substituting the Amber Filigreed Doublet with the Cerulean Filigreed Doublet, and the Captain Sanders’ Sash for the Azure Silk Belt. I hope these have given you some ideas on different Midsummer outfits your character can sport. 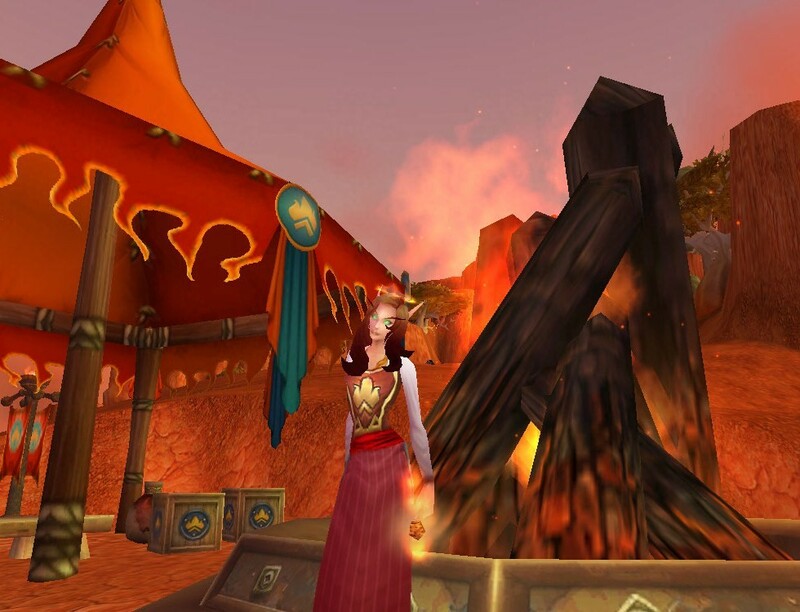 Happy Midsummer Fire Festival to you!